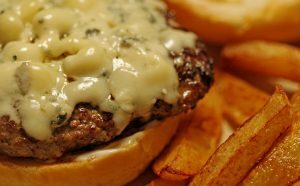 A small scoop of homemade Gorgonzola butter on your grilled burgers, steak or chicken and you’ll be in food heaven. Plan on one teaspoon per person. Mix together a softened stick of unsalted butter with a package of crumbled Gorgonzola cheese. And when the meat is just off the grill, add one teaspoon of the butter mixture to each piece of meat and watch it start to melt. What’s great about this is that we’re only using a small amount of butter and cheese as a flavoring agent. If you prefer a different cheese, go for it.